The cruise terminal is downtown Sydney. Make sure you take a picture of World’s Largest Fiddle on the dockside. St. George's Anglican Church was the garrison church when Sydney was founded. Nearby is Cossit House. Built in 1787, Cossit House is probably the oldest house in Sydney. It was home to Cape Breton's first Anglican Minister and first rector of St. George's Church, the Rev. Rana Cossit. The period furnishings are based on a inventory of Cossit's estate in 1815. On the Esplanade, a street which parallels the waterfront, there are monuments and plaques which commemorate some of the city's famous people and events. Also, on the Esplanade, across from the Government Wharf, is the old stone St. Patrick's Church Museum. This is the oldest standing Roman Catholic Church on the island (1828) and it now houses a collection of early Sydney artifacts. It is the starting point for guided walking tours of the historic north end. The Cape Breton center for Science and Heritage, is a museum which features changing exhibits. There is a museum shop with books of local interest, souvenirs and jewelry. Jost House is a 200 year old building which illustrates the evolution of a wooden dwelling house in Sydney. There is an authentic cooking fireplace and bake-oven and special displays on local marine artifacts and an apothecary shop. The Holy Ghost Ukrainian Church is the only one of its kind east of Montreal and is richly decorated with Byzantine-style holy pictures, icons and scrollwork. St. Mary's Parish Church has a white gothic pulpit decorated with Poland's national symbol - the eagle. St. Phillips is the only African Orthodox Church in Canada and was originally founded by West Indians who settled in Cape Breton. The three churches are open for regular services and all found in Whitney Pier. Sydney is very small and walkable. You will need to rent a car, take a taxi or tour to visit sites further out. 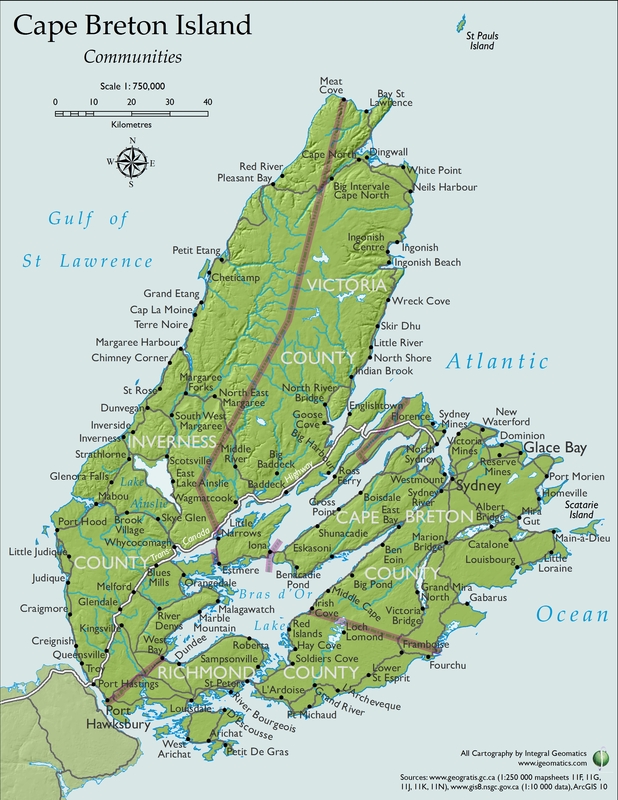 As soon as you cross the Seal Island Bridge over to Boularderie Island on the Trans-Canada Highway, you are on the 'Northside' as it is called in Cape Breton. The community of Bras d'Or has many campgrounds, picnic sites and swimming areas. From here, Route 223 will take you along the shoreline of St. Andrew's Channel to Georges River and Barachois harbor, where there are several service stations, restaurants and stores. Louisbourg is located beside the Fortress of Louisbourg National Historic Site. Besides this interesting historic treasure, beautiful island and magnificent seascapes and beaches also await you in Louisbourg. Taxis can be is short supply when you dock, either take the ship's tour or reserve a taxi in advance, especially if you travel with a larger group.